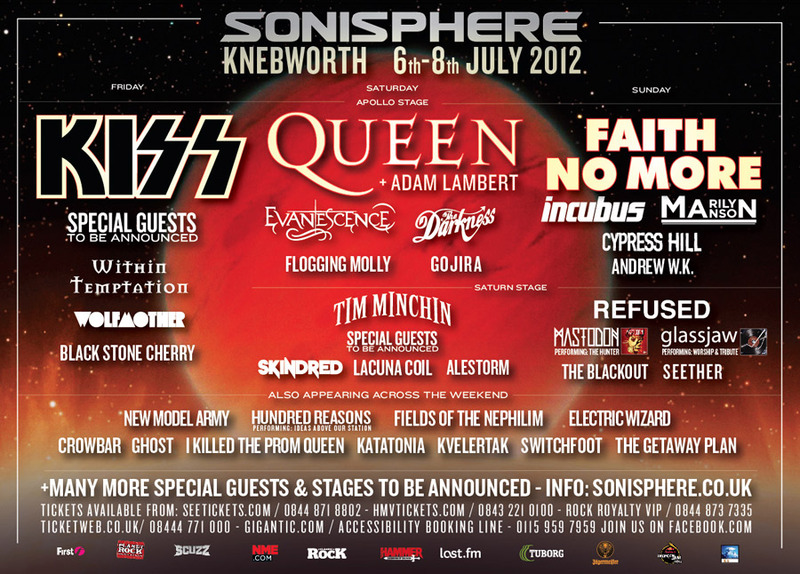 “It is with very heavy hearts and much regret that we announce the cancellation of Sonisphere Knebworth 2012. Putting the festival together in what is proving to be a very challenging year was more difficult than we anticipated and we have spent the last few months fighting hard to keep Sonisphere in the calendar. Unfortunately circumstances have dictated that we would be unable to run the festival to a standard that both the artists and that Sonisphere’s audience would rightly expect. While not addressing any of the specific rumours as to why the festival was being cancelled, Team Sonisphere confirmed that they could not put on a successful festival this year at Knebworth. What I am going to do is address some of the rumours as to why it has been cancelled. This was the line-up for the festival as it got cancelled. For me personally, it is not a bad line-up but it is far from amazing. I have long said that Kiss is a band I would like to see, but the circumstances have to be right. I am unlikely to go to a headline tour as it costs too much money (the rumoured tour of Kiss and Motley Crue may change this). As a festival headliner, if they are alongside two other great headliners then I would be drawn to that festival. Faith No More are a great headliner and that was one half of what I needed. Queen with Adam Lambert is alright but wasn’t enough to draw me to the festival. Faith No More being on the Sunday was an odd call for me. Of the headliners in terms of band size, I really would think they were the smallest (in drawing power) so to have them closing the festival...not sure about that. As for the rest of the line-up, there were two special guest slots to fill which I can’t really comment on with any degree of authority as I only heard rumours. I heard Motley Crue for the Friday and Primus for the Saturday. In terms of drawing power, they would have been big announcements. There is very little else I can point to and say “wow” at (based on my own tastes). Evanescence is a fairly big name and they sold out some fairly big dates last year. The Darkness is a fairly big announcement as they have their own forest gig this year, but maybe that’s detrimental to Sonisphere. Their fans are more likely to have gone to that, and seen them headline rather than go to Sonisphere (I’d guess). They had 3 bands doing full album shows but if you don’t like those bands (I don’t), that isn’t a draw - especially when one played the festival the year before. I said from the off I don’t think Tim Minchin should be in that spot. I don’t think he’d go over as well as Bill Bailey did, and I hear the sound for Bill Bailey was awful anyway. There is nothing else from the undercard which stands out to me really. I guess I could mention Andrew WK and Cypress Hill. Both strong bookings I would say. Andrew WK did just sell a fair few tickets though for headline shows so would this have stopped people buying a Sonisphere ticket? Who knows? The last band I want to mention is Marilyn Manson. I’m informed his 2009 set at Download was atrocious. Before that set there were question marks over his live performance at festivals and for me, this was a weak booking in a big spot on the main stage. Yes, he can put on a show but that’s not an adequate excuse for a shocking live performance. Sonisphere announced their first bands for their first Knebworth festival in February. This wasn’t seen as a problem because this was fairly standard for most festivals to start announcing around this time. It also wasn’t a problem as in 2009; it was the same weekend as the Wacken festival in Germany, i.e. the first weekend in August. In 2010 it was also towards the end of July/beginning of August but they announced the first bands in 2009. They announced before Christmas that Rammstein and Iron Maiden were headlining, sending a clear message to competitors. For the 2011 festival, we knew all the headliners before Christmas, as well as some of the undercard as well. Aside from its first year, Sonisphere announced its bands early. 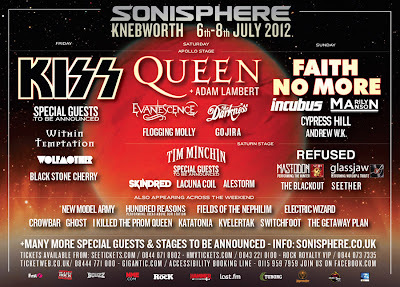 So when Christmas 2011 rolled around and there were no bands announced for Sonisphere 2012 – something didn’t seem right. Not only was there no announcement but there was no announcement about an announcement (say announcement again!). As the days and weeks went on, there were rumours an announcement was due but nothing came. . Even Kerrang published an advert saying that the announcement would be in their next magazine. It wasn’t. People were getting annoyed and saying that they had to make arrangements. People defending the festival said that this wasn’t as wide spread as it seemed, but almost every other festival was announcing bands or had rumours floating. Eventually however, at the end of February – the first announcement was made. Since then I believe there has only been one other announcement but it got us to the line-up that I posted above. Low ticket sales – well looking at that line-up, there is some good stuff on there. There is also some bad stuff on there – to the extent that I was only discussing getting a weekend ticket if I got a new job (and still ended up opting for Hellfest). So, I completely find it believable that the line-up just wasn’t good enough to convince people to part with £200 at this stage. Sonisphere has booked some epic festivals, and I do believe had it not been cancelled that the line-up for the 2012 festival would have got much stronger as the undercard filled out. However, if they needed a good number of ticket sales up front, this was not the way to go about it. Even though they had some serious exclusives announced – well you either like them or you don’t. Some for me I didn’t mind but there was not one exclusive which really made me want to go (other than Faith No More...more on that later). Looking at low ticket sales though, I have to go back to the lateness of the announcement and the lack of communication from the festival to its potential punters. It would have been so easy to send out a public tweet or Facebook update saying “announcement is coming on 20th Feb...apologies for the lateness of it” or something like that. TL;DR – I can completely believe with how long it took them to announce this line-up, and actually what they announced, that they didn’t sell many tickets. I am hearing figures quoted between 5-10k tickets. That is shocking considering some of the acts on this line-up. Financial Backing – There were rumours floating around that the festivals financial backers pulled out. Now, this could be linked to low ticket sales (investor see’s figures for sales and in a panic, pulls out). It could be linked to the global financial crisis which is still going on somewhat. That wouldn’t make a great deal of sense though as it ran when the crisis was worse. I guess the crisis could be to blame if you consider the financial backers performance as a company worsening. It is something I don’t really know about but I think if the financial backer has pulled out, it is more likely to be linked to low ticket sales. Facilities – There was a rumour circulating that the whole festival was cancelled as they couldn’t get enough security to cover the event and they couldn’t get enough toilets. These two things were linked to the fact that 3 weeks after Sonisphere, the Olympics come to London. This one seemed slightly odd to me, to the point that I don’t think it’s true. Security could be issue I guess if the security companies have all been contracted by the Olympic organisers and have to receive special training beforehand. But even that sounds quite excessive. The toilets one sounds even more ridiculous on reflection. I’m sure if you weighed up the cost of cancelling bands; it would cost a hell of a lot less to ship portaloo’s in from another part of Europe/the world. I’m not sure about this one, but if this is the case then someone has seriously boobed. The Olympics were announced as coming to this country in July 2005. It is not like they snuck up on anyone. Glastonbury took this into account and extended the time in which they are “on” so that they would be “off” during the Olympics. Granted, Sonisphere announcing they were going to take a year off after 3 years would have been odd, but it would have been better than announcing a lot of stuff and then cancelling it. The question on a lot of people’s lips now is this – can Sonisphere come back from this? Personally, I think it is going to be tough. I’ve touched on it already but the communication from the festival this year has been shocking and you just cannot get away with that in the 21st century and the age of social media. If they are going to come back, this needs to change. They will need to keep people as informed as they possibly can. The brand has not completely died across Europe, so there is a chance that the brand has a future in this country but I just don’t know if people will trust them. By people, I don’t just mean punters – I mean bands and agents. The fact it had to be cancelled in its fourth year is not a good thing. The best way for them to resolve the trust issue in my view is to re-launch Sonisphere UK in 2013 as a one day festival with 2 day camping. What they then need to do is book a very safe act that will sell tickets to not only play, but to curate the festival. Co-brand the festival with this big ticket selling band and rebuild trust. In my mind, I picture Iron Maiden on their Made in England tour being a perfect choice for this. Getting Maiden for this slot will sell tickets as it will be their only UK date on this new “history of” tour. They came very close to selling out Twickenham, which I heard was quoted at 65k people for a gig. That is what I also hear the crowd for gigs at Knebworth are. Book Iron Maiden for this slot and Sonisphere is back. If they go full out again, people might not trust them and they may be forced to cancel again. If it happens again – they are completely finished (assuming they aren’t already). As a final point, I would be gutted if Sonisphere UK died because of this. Their booking choices really made people sit up a take notice (first comedian headlining an open air stage, booking Richard Cheese etc). The layout of the festival is almost perfect as well (I am a big fan of alternating stages). It was also nice to have two festivals competing for my money that was completely to my tastes (or really close) in this country. I have no problem going abroad but if it is in this country then why not hope for the best. I hope it can come back, but truthfully I don’t think it will. As a finally final point, I really hope that Faith No More announce a replacement date so they can visit these shores.